Woden is a complex and elusive figure in Anglo-Saxon history. Like his Norse counterpart Oðinn, he has been thought to be the chief god of his pantheon, dominating most aspects of heathen worship within that culture. Scholars have debated the significance of these gods and their relationship to one another. Anthony Faulkes has addressed the genealogical role of Oðinn in twelfth and thirteenth century texts; Richard North has argued that the genealogical role of Oðinn in pre-Christian Scandinavia was the result of influence from Woden’s role in Anglo-Saxon England. North has also argued that early Anglo-Saxon bishops played a significant role in establishing Woden as an ancestor while Charlotte Behr argues that the popularity of the cult of Woden means that his role as a progenitor could have been employed before the conversion. The popularity of his cult is supported by the distribution of English place names derived from the name Woden as well as analysis of archaeological sources but neither prove he was a progenitor of kings at an early stage. The essay will attempt to determine the origin of the cult of Woden and also to explore the functions, history and patterns of Woden’s inclusion in royal genealogies. The earliest written documentation of Woden as an ancestral figure for royalty is in Bede’s Historia ecclesiastica gentis Anglorum (HE) and later in the Anglo-Saxon Chronicle. Smote then that adder that in nine bits she flew apart. That she never would turn into the house. For poor and for rich, for all a remedy. If Oðinn has some basic similarities to the Anglo-Saxon Woden then the most valuable information about the god that can be taken from the Eddic verses, in regards to royal genealogies, is that he was a king. As well as being the Lord of the gods, he is god of war, poetry, frenzy and is depicted as a father to gods and men, referred to as Alföðr (all-father). Oðinn’s most beloved son is Baldr, whose name is cognate with Old English bealdor but is not the same as Woden’s son Bældæg, who also appears in the regnal lists of the Anglo-Saxon Chronicle, though their names are similar. The earliest manuscript showing Woden in a genealogy is contained in the Anglian collection, completed in 812. 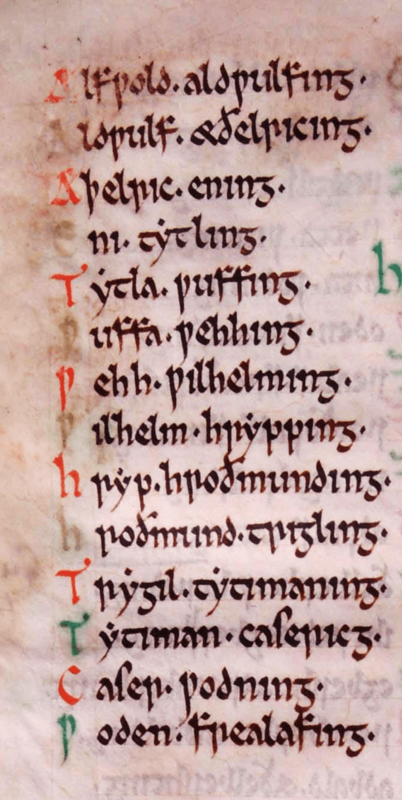 Bede’s HE was completed in 731 and lists the genealogy of Æthelberht of Kent (560-616) who he says was descended from the semi-mythical English progenitor, Hengest, who in turn was descended from Woden. Bede also says that many other kings claim descent from Woden. Eric John believes that the genealogy deriving from Woden was not written by Bede himself and was only included in HE because it had been sent to him by someone of such a position that it would have been unwise to leave it out. 547. Here Ida, from whom originated the royal family of the Northumbrians, succeeded to the kingdom and ruled twelve years. And he built Bamburgh, which was first enclosed with a stockade and thereafter with a wall.’ Ida was Eoppa’s offspring, Eoppa was Esa’s offspring, Esa Ingui’s offspring, Ingui Angenwit’s offspring, Angenwit Aloc’s offspring, Aloc Benoc’s offspring, Benoc Brand’s offspring, Brand Bældæg’s offspring, Bældæg Woden’s offspring, Woden Frithowulf’s offspring, Frithowulf Finn’s offspring, Finn Godwulf’s offspring, Godwulf Geat’s offspring. Woden is consistently placed at nine removes from the founder of a dynasty. There are six unrelated examples of this pattern in the various genealogies and William of Malmesbury refers to three other founders of dynasties as “tenth, as they say, from Woden,” which suggests that he recognised the motif as a traditional one. He goes on to point out that such numerical patterns are not specifically Germanic, since they can also be found in Welsh, Irish and biblical genealogies but that they do demonstrate the symbolic nature of the early stages of the genealogies. Nine was a significant number in regards to Oðinn and Norse mythology and it occurs in both Lacnunga and Hávamál so it is possible that there was a spiritual discipline associated with the construction of the genealogies themselves. It is possible to interpret the archaeological evidence found at Finglesham, Eastry and Woodnesborough, the meaning of the place-names, the documentary evidence of a royal villa, and the exceptionally rich graves in the cemetery of Finglesham as well as the cremation grave, the objects linked to the cult of Woden (not only the bracteates but also the belt-buckle and the pendant) as pointing to an important political and religious centre in the sixth century. The ancient earthwork of Wansdyke (Wodnes dic or `Woden’s dyke’ in a charter of A.D. 903), above the Vale of Pewsey in Wiltshire and Somerset, was probably a cult-centre of the god, running as it does between Wodnes beorg (in a charter of A.D. 825 and the Anglo-Saxon Chronicle sub annis 592 and 792) , ‘Woden’s barrow’, and Wodnes dene, ‘Woden’s valley’. In central Mercia the present place-names of Wednesbury (Wadnesberie of Domesday Book, Woden’s fortress’) and Wednesfield (Wodensfeld of Domesday Book, ‘Woden’s open country’) attest to his worship, as do the village of Wensley (Wodnesleie, ‘Woden’s grove’) in Derbyshire, the half-hundred of the same name or Wenslow (Weneslai in Domesday, but Wodneslawe in A.D. 1169) in Bedfordshire, and the hundred of Wodenslawe (‘Woden’s mound’), also in Bedfordshire, all in Anglian lands. Another Wodnesfeld, perhaps to be identified with Wanswell in Gloucestershire, is mentioned by Florence of Worcester sub anno 911. The pedigree or pedigree-collection has, in fact, a wide variety of political applications…It can be expression of something wider than kingship: it can proclaim political alliances and overlordships; it can announce belief in the existence of racial grouping; it can seek to express an harmonious political order. The West Saxon pedigree above Cerdic, the founder of the dynasty, is in whole or in part… a construction;…If an earlier pedigree for Cerdic was ever known, it has disappeared entirely from our sources; but we should not necessarily insist that there ever was one. The very peoples of the English, their kingdoms and their kings, fight among themselves. Scarcely anyone can now be found from the ancient stock of kings, and the more uncertain their origin, the more they lack valour. Given…on the one hand that the myth of divine descent was in England applied specifically to royal dynasties, and on the other that orally transmitted dynastic histories actually existed among the Anglo-Saxons, little doubt can remain that, in beginning their lists with Woden and Seaxnet, the ecclesiastical compilers of the Anglo-Saxon royal genealogies were following pre-existing, orally transmitted dynastic origin legends comparable to those attested on the Continent, in which descent from heathen gods was featured. The function of Germanic divine descent was to ensure that the ruler was entitled to his position through right of kinship. Evidence for the kin-centred basis of Anglo-Saxon kingship can be found in the etymology of the word cyning (king), which may mean ‘son of the cyn or family’, specifically in the context of the royal bloodline. Cyning is cognate with German könig and Old Norse konungr, so it is likely that this conception of kingship was widespread among Germanic peoples. The Anglo-Saxons regarded sacral inheritance and their traditions of kingship as a vital part of their tribal identities. It is because of this awareness of their Northern heritage that later English missionaries and their converts were determined not to be separated from the pagan and secular traditions that dictated the hierarchy of their society. But the origin of this practice may be Roman, rather than Northern. Óðinn perhaps stands out because…this figure was imported northwards, as Mercury, across the upper Rhine in the first few centuries of this era, thence into Southern and Northern Germany and the low Countries, Southern England and Scandinavia. Anglo-Saxon sources also equate Woden with Mercury; Ælfric of Eynsham refers to Mercury in the context of mountain sacrifice in his De falsis diis, which Richard North has interpreted as a form of Odinic worship on the basis of a comparison with the Old Norse poem Atlakviða. It must be noted, however, that Ælfric was eager to distinguish Woden from the god of the marauding pagan Vikings, Óðinn. In the late Anglo-Saxon period, Ælfric refers to Óðon, an anglicised form of Óðinn, rather than the English Woden. Ælfric may have withheld the knowledge connecting the two gods, in an effort to disguise the fact that his patrons Æthelweard (d. 1000) and Æthelmær (d. 1017), and also king Æthelred (978-1016) could claim descent from the same pagan god that their Viking enemies worshipped. It is also possible that this is, as Meaney asserts, simply an unveiled reference exclusively to the Scandinavian and not the English god. His genealogical role would thus remain untainted by association with the Viking god. In either case it is clear that the genealogical attitude to Woden changed a great deal during the Anglo-Saxon period. The early Anglo-Saxon family unit was derived as much from the comitatus as from the tribe itself. The model for hierarchy and leadership was derived from that of the comitatus on the move but had to adapt when it settled in England. Thus Woden was promoted from the position of a war-god tasked with bringing fortune in battle, to an ancestral figure that could legitimise authority and elevate a specific family by “investing it with divine sanction”. For the non-royal nobility, the status of stirps regia, achieved through genealogy, was also desirable as it was needed in order to maintain their own wealth and power and for their family to one day ascend to a higher social position. Once this position was achieved, Woden had proved they were capable of ruling, but he could not protect them from rival claimants who also claimed this divine descent. The stirps regia, as a higher race tasked with mediating between gods and man, depended upon its charismatic quality which elevated them from the masses through divine descent. For Alcuin, as for Bede, it was no embarrassment to have kings descended from pagan gods (who could anyway be written off as deified heroes), so long as this descent was illustrious. Even sophisticated churchmen sought political stability in the ancient, originally pagan, concept of hereditary royal charisma, and lamented its disappearance from England. Possible analogues for the integration of Woden’s genealogical role into Christian Anglo-Saxon England can be found on the continent. Among Germanic peoples in mainland Europe, conversion did not weaken belief or interest in descent from the gods, Wallace-Hadrill argued that it may even have strengthened it. Christianity was brought to the East Germanic peoples in the form of Arianism which was probably influenced by paganism. The missionaries appealed to the leaders who looked to deities for support and could have seen the benefit of the hierarchical nature of the Arian holy trinity. It is likely that a similar type of integration occurred among the Anglo-Saxon tribal leaders when confronted with Catholicism so that certain aspects of secular hierarchical structures were maintained because the conversion was applied in a top down process. Woden was thus preserved but in a less powerful form, the status of his genealogical role would have been greatly diminished through euhemerisation, though we cannot be certain this role existed at all in the pagan era. This would have left a vacant position available for a new divine ancestor so the genealogy was pushed back to Frealaf, then to Geat, then to Sceaf and finally to Christ. The lists did not function as mere antiquarianism but were required to reflect the history and power structure of the current social hierarchy. Woden’s power as an ancestral figure was declining throughout the Christian era; Woden’s endurance in England was a product, primarily, of eighth century traditions but towards the end of the century, in the time of Offa, names needed to be added above Woden’s, showing that by this time he had been euhemerised. By this stage he would have had no more importance than the other heroic figures from Northern history and legend that feature in genealogies, such as Geat, Heremod, Scyld and Finn. Genealogists in the service of rival royal houses were competing with one another to construct the most distinguished pedigrees, so not only the pedigree of Mercia but also those of Deira, Bernicia, Kent and East Anglia were all extended beyond Woden to Frealaf, a hero whose name indicates a possible relation to the Scandinavian fertility god, Freyr. This assertion is based on the fact that the fréa and freyr forms are morphological cognates, but the Old English fréa simply means “lord” and was a commonly used word, so the true identity of Frealaf is uncertain. Through interpretation of The Anglo-Saxon Rune Poem, Chaney identifies the ‘Os-’ prefix, signifying ‘(heathen) god’ or ‘divine’, as being associated with Woden. This could connect all rulers with the prefix ‘Os-’ (which includes 12 Northumbrian rulers) directly to the god. Davis goes further and suggests that the Kentish progenitor, Oisc and even his father Hengest could both actually have been Woden in his generic classification as os. The Kentish king-list could have been a collection of many names for the same ancestral war-god and over the ages they emerged as separate euhemerised heroes, preserved by Bede. The height of Woden’s power was in the pagan era while he was still revered as a god, for Oðinn it was much later, probably when Snorri promoted him to king of the Æsir. Woden’s genealogical role may have preserved his name in the memory of the Anglo-Saxons, as is the case for numerous heroic figures included in ancestral lists, but his cultural significance was depleted as Christianity became a more dominant ideology. Though not originally a progenitor and though eventually a mere euhemerised hero, the original significance and popularity of his cult is proven by his prominence in king-lists and the frequency of place names, king’s names and the names of heroes that are derived from or related to his own. 1 Charlotte Behr ‘The origins of kingship in early medieval Kent.’ in Early Medieval Europe, vol.9, (Blackwell Publishers Ltd: 2000), p.29. 2 J. H. G. Grattan, (trans), Anglo-Saxon magic and medicine: illustrated specially from the semi-pagan text “Lacnunga”, (London: Oxford University Press, 1952) pp.153-5. 3 Richard North, Heathen gods in Old English Literature, (Cambridge: Cambridge University Press, 1997). p.87. 5 Orchard, ‘Grímnismál’ v.48 in the Elder Edda, p. 58. 6 North, Heathen gods, p.125. 7 Bede, Ecclesiastical History of the English People, Colgrave, Bertram, Mynors, R.A.B., (eds) (Oxford University Press: 1969), p.151. 8 Eric John, ‘The Point of Woden’ in Anglo-Saxon Studies in Archaeology and History 5, (Oxford University Committee for archaeology: 1992), p. 130. 9 Hermann Moisl, ‘Anglo-Saxon royal genealogies and Germanic oral tradition,’ in Journal of Medieval History 7, (3), (September 1981), p. 227. 10 Michael Swanton, (trans and ed), The Anglo-Saxon Chronicle, (Phoenix press, 2000), p.16. 11 Thomas. D Hill, ‘Woden and the pattern of nine: numerical symbolism in some old English royal genealogies’ In Old English Newsletter, vol 15, no.2, (1982), pp 41-2. 12 North, Heathen gods, p.320. 13 Behr, Origins of Kingship, p.45. 15 William Chaney, The Cult of Kingship in Anglo-Saxon England: The Transition from Paganism to Christianity, (Manchester University Press: 1970) pp.36-7. 16 John, Point of Woden, p 130. 17 Patrick Wormald, ‘The Age of Offa and Alcuin’ in The Anglo-Saxons, James Campbell [et al. ], (Oxford, Phaidon: 1982), p.116. 18 John Ronald Reuel Tolkien, Finn and Hengest : the fragment and the episode , Alan Bliss (ed), (London, Allen & Unwin: 1982), p.46. 19 David. N. Dumville, ‘Kingship, Genealogies and Regnal Lists’ in Early medieval kingship, P.H. Sawyer and I.N. Wood. (eds), (The University of Leeds:1977), p.77. 20 Wormald, Age of Offa and Alcuin, p.116. 21 Moisl, AS royal genealogies, p. 227. 22 Dumville, ‘Kingship, Genealogiesand regnal lists’, p.79. 23 Dummler (trans) in, Age of Offa and Alcuin, Wormald, p.116. 24 Wormald, Age of Offa and Alcuin, p.116. 25 Patrick Wormald, “Bede, Beowulf, and the Conversion of the Anglo-Saxon Aristocracy,” in Bede and Anglo-Saxon England: Papers in Honour of the 1300th Anniversary of the Birth of Bede, Given at Cornell University in 1973 and 1974, British Archaeological Reports no. 46, Robert T. Farrell (ed), (London, 1978), pp.56-57. 27 Dumville, ‘Kingship, Genealogies and regnal lists’, p.83. 28 Moisl, AS royal genealogies, p. 228. 30 Chaney, The Cult of Kingship, p.15. 32 Chaney, The Cult of Kingship, p.16. 34 Wormald, Bede, Beowulf, p.50. 35 J.M. Wallace-Hadrill, Early Germanic Kingship in England and on the Continent, (Oxford: Clarendon Press, 1971), p. 8. 37 Snorri Sturluson, Heimskringla volume 1: The Beginnings to Olafr Tryggvason, Alison Finlay, Anthony Faulkes (trans) (Viking society for Northern Research, UCL: 2011), Ch. 10, pp.13-14. 38 Wallace-Hadrill, Early Germanic Kingship, p.13. 39 North, Heathen gods, p. 112. 40 Wallace-Hadrill, Early Germanic Kingship, p.13. 41 North, Heathen gods, p.305. 43 W. W. Skeat, (ed), Ælfric’s Lives of Saints: Being a Set of Sermons on Saint’s Days Formerly Observed by the English Church, (Oxford: 1966) II, 265, line 715 (XXXI.xxiv). 44 North, Heathen gods, pp. 81-2. 45 A. L. Meaney, ‘Woden in England: a reconsideration of the evidence’ in Folklore, Vol. 77, No. 2 (Folklore Enterprises, Ltd: 1966), p. 109. 46 John, Point of Woden, p. 133. 48 Chaney, The Cult of Kingship, p.28. 49 David. N. Dumville, ‘The ætheling: a study in Anglo-Saxon constitutional history’ in Anglo-Saxon England, 8, (Cambridge University Press: 1979) p.32. 50 Dumville, The ætheling, p.33. 51 Wormald, Age of Offa and Alcuin, p.116. 52 Wallace-Hadrill, Early Germanic Kingship, p. 9. 53 Craig. R. Davis, ‘Cultural assimilation in the Anglo-Saxon royal genealogies’ in Anglo-Saxon England, 21 (Cambridge University Press: 1992), p.36. 54 Moisl, AS royal genealogies, p. 234. 55 Meaney, ‘Woden in England’, p. 110. 56 Tolkien, Finn and Hengest, p. 46. 57 Davis, ‘Cultural assimilation in the AS royal genealogies’, p28-9. 58 Chaney, The Cult of Kingship, p.23. 59 Davis, ‘Cultural assimilation in the AS royal genealogies’, p. 27. Aelfric, Abbot of Eynsham. : Homilies of Aelfric : Vol 2 , John C.Pope (ed) (London: Oxford University Press, 1968). Bede, Ecclesiastical History of the English People, Colgrave, Bertram, Mynors, R.A.B., (eds) (Oxford University Press: 1969). Dumville, D. N., ‘The Anglian Collection of Royal Genealogies and Regnal Lists’ in Anglo-Saxon England 5(1976), p.23-50. Ernulf, Bishop of Rochester, Textus Roffensis: Rochester Cathedral Library manuscript, A, 3.5, pt.2 (1962). Grattan, J. H. G (trans) Anglo-Saxon magic and medicine: illustrated specially from the semi-pagan text “Lacnunga”, (London: Oxford University Press, 1952). Heaney, Seamus (trans), Beowulf a verse translation, Daniel Donoghue (ed), (New York: Norton, 2000). Orchard, Andy, The Elder Edda, (Penguin Classics: 2011). Sturluson, Snorri, Heimskringla: volume 1 The Beginnings to Olafr Tryggvason, Alison Finlay, Anthony Faulkes (trans) (Viking society for Northern Research, UCL: 2011). Swanton, Michael, (trans and ed), The Anglo-Saxon Chronicle, (phoenix press, 2000). Tacitus, Cornelius, The Agricola; and, The Germania, H. Mattingly (trans) (London: Penguin, 1970). Abram, Christopher, Myths of the Pagan North, (Continuum: London, 2011). Behr, Charlotte. ‘The origins of kingship in early medieval Kent’ in Early Medieval Europe, vol.9, (Blackwell Publishers Ltd: 2000), pp 25–52. Chaney, William, The Cult of Kingship in Anglo-Saxon England: The Transition from Paganism to Christianity, (Manchester University Press: 1970). Davis, Craig. R., ‘Cultural Assimilation in the Anglo-Saxon Royal Genealogies’ in Anglo-Saxon England, 21 (Cambridge University Press: 1992), pp. 23-36. Dumville, David. N., ‘The ætheling: a study in Anglo-Saxon constitutional history’ in Anglo-Saxon England, 8, (Cambridge University Press: 1979) pp 1-33. Dumville, David. N., ‘Kingship, Genealogies and Regnal Lists’ in Early medieval kingship, P.H. Sawyer & I.N. Wood (eds), (Leeds: 1977). Faulkes, Anthony, Six papers on The Prose Edda: Descent from the gods. 2nd ed, (Viking society for northern research: 2007), http://vsnrweb-publications.org.uk/. Hill, Thomas. D., ‘Woden and the pattern of nine: numerical symbolism in some old English royal genealogies’ In Old English Newsletter, vol 15, no.2, (1982), pp 41-2. John, Eric, ‘The Point of Woden’ in Anglo-Saxon Studies in Archaeology and History 5, (Oxford University Committee for archaeology: 1992) p.127. Meaney, A L., ‘Woden in England: a reconsideration of the evidence’ in Folklore, Vol. 77, No. 2 (Folklore Enterprises, Ltd: 1966), pp. 105-115. Moisl, Hermann, ‘Anglo-Saxon royal genealogies and Germanic oral tradition’ in Journal of Medieval History 7, (3), (September 1981), pp. 215-248. North, R, Heathen gods in Old English literature, (Cambridge: Cambridge University Press, 1997). Tolkien, John Ronald Reuel, Finn and Hengest: the fragment and the episode, Alan Bliss (ed), (London: Allen & Unwin, 1982). Wallace-Hadrill, J.M., Early Germanic Kingship in England and on the Continent, (Oxford: Clarendon Press, 1971). Wormald, Patrick, “Bede, Beowulf, and the Conversion of the Anglo-Saxon Aristocracy,” in Robert T. Farrell (ed), Bede and Anglo-Saxon England: Papers in Honour of the 1300th Anniversary of the Birth of Bede, Given at Cornell University in 1973 and 1974, British Archaeological Reports no. 46 (London; 1978), pp. 32-95. Wormald, Patrick, ‘The Age of Offa and Alcuin’ in The Anglo-Saxons, Campbell, James [et al.] (Oxford: Phaidon, 1982), Ch. 5, pp. 105-28.